Millie D's Words: Sweet Peril Cover Reveal! Guess what, guys! Guess what! *jumps around, claps hands* I haz another cover reveal for you all this week! HOW AWESOME IS THAT?!?! Two awesome cover reveals in one considerably good week. It is like there are Forces in the Book World that are sprinkling happiness on me right now. But you're probably wondering what the cover of Sweet Peril by Wendy Higgins looks like, yes? Good news! I have it! And I will SHOW IT TO YOU! Anna Whitt, daughter of a guardian angel and a demon, promised herself she’d never do the work of her father—polluting souls. She’d been naive to make such a claim. She’d been naive about a lot of things. Haunted by demon whisperers, Anna does whatever she can to survive, even if it means embracing her dark side and earning an unwanted reputation as her school’s party girl. Her life has never looked more bleak. And all the while there’s Kaidan Rowe, son of the Duke of Lust, plaguing her heart and mind. LOOK AT THE GORGEOUSNESS!!! Did I ever think I'd see Anna wearing black? No. Did I ever think I'd see Kaiden looking like an innocent little angel--which he is not? No. Did I ever think I'd see Anna looking all dark, mysterious, and smexy? Not in a million years! This is all making me wonder. What is going on here in the book that is Sweet Peril? Has Anna gone to the Dark Side? Is Kaiden love-sick? In all, the want for this book is strong. Very strong. Wendy Higgins was born in Alaska, grew up an Army brat, and lived all over the United States before settling in the Washington, DC area. 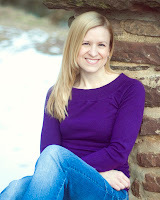 She attended George Mason University for her undergrad degree in creative writing, and Radford University for her masters in curriculum and instruction. Wendy taught 9th and 12th grade English in a rural school before becoming a mother and author. She now lives in Northern Virginia with her husband, daughter, and son. Sweet Peril is her second novel. So pretty isn't it!? I have to read Sweet Evil now hah.